the First Religious Profession of eight new Brothers of the Christian Schools. The Eucharist was presided by Father Dominic Sawadogo, a Religious Carme and one of the external formators in Novitiate. Six other Priests concelebrated the Mass with him. The Vows were received by Brother Dieudonné KOLOSNONRE, Acting Visitor in the absenceof Brother Janvier DEMBELE, Visitor of the District of West Africa. Before the assemby of over nearly a hundred of faithful, our new Brothers have publicly said their “yes” to God, Holy Trinity, by the formula of vows of our Institute. second round, three Congoleses, two Malgaches and one Benineses pronounced respectively their vows in Portuguese and in French. All those who came to live this great event and support our new Professed, religious, lay and priests have heard them say “I promise and vow …” at the decisive moment of the rite of Religious consecration. In the assembly, many Christian Brothers from communities in Burkina Faso including Brother Domingos FAZVER, who came from Abidjan, were present . It was with great joy that they welcomed the new professed at the time of brotherly hug. After the Eucharist, a fraternal meal is shared by all the guests at the party. 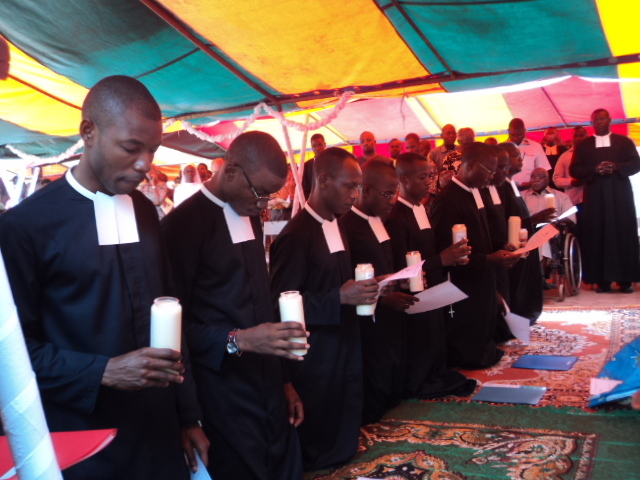 The eight new African Brothers have walked in the path Saint John XXIII, 17th promoting the Novitiate of Bobo-Dioulasso (founded in 1997). They started their training in September 2012 with a total of twelve Novices, under the leadership of former Director Brother Valere ADONSOU. The theme of their formation journey was “Journey of faith of a pagan. “Only say the word …” (John 7.7 b). They finished their formation journey in the Novitiate with eight Novices (now professed), thanks to the Direction of Brother Sylvain CONSIMBO, current Director of the Novitiate.